There are several design elements in both finish and furniture selection that are becoming popular in corporate interiors. The use of natural or raw materials continues to be prevalent. We are especially seeing wood or wood-look products used in various applications as accent walls, ceiling features and flooring. Clients are requesting impactful, higher-end looking reception and entry areas that incorporate their brand and logo whether that is through color, materials or both. Flexible work spaces are catching on more and more here which is exciting because of the benefits they provide. This can be simple, such as height adjustable work surfaces or more complex where the entire office layout and furniture arrangements provide multiple work options for employees. In addition to traditional private offices, touch down spaces and collaboration areas are mixed in with more intimate spaces for heads down work. In some offices we are seeing the private office disappear completely. This creates a space that has a relaxed vibe and gives users the ability to work comfortably no matter what their style or needs. Resimercial is a buzzword used to describe this type of design environment as it feels more like working from the comfort of home than a stagnant office. There are reasons these design trends are becoming popular. To put it simply, it is all about user experience. In the fast-paced environment we live in today, the world is quite literally at our fingertips in the form of whatever piece of technology we are holding. Since it is possible to receive most all services online, businesses are realizing the importance of creating positive and personal experiences for their clients. Creating an entry and lobby space that embodies and emphasizes the company’s brand can make a big impact. It puts forth a sense of pride and can instill confidence in the client they are making the correct choice to do business there. However, user is not only the client, but also the owner and employees. Designing spaces that are conscious of ergonomics and physical and mental health can increase productivity and engagement among employees. In turn, this increases the quality of work put out by a company and its profitability. A flexible office layout and mindful material selections both achieve this. Biophilic design incorporates the theory that humans have a significant connection to nature. The use of wood and materials found in nature can have a positive psychological impact and increase overall wellness of users within a space. Hausmann Construction is a project we completed recently that incorporated several of the design trends mentioned above. The success of the project can be attributed to the knowledge of these trends and more importantly, the collaboration between the owner and design team to implement them in their space to best serve their specific needs. 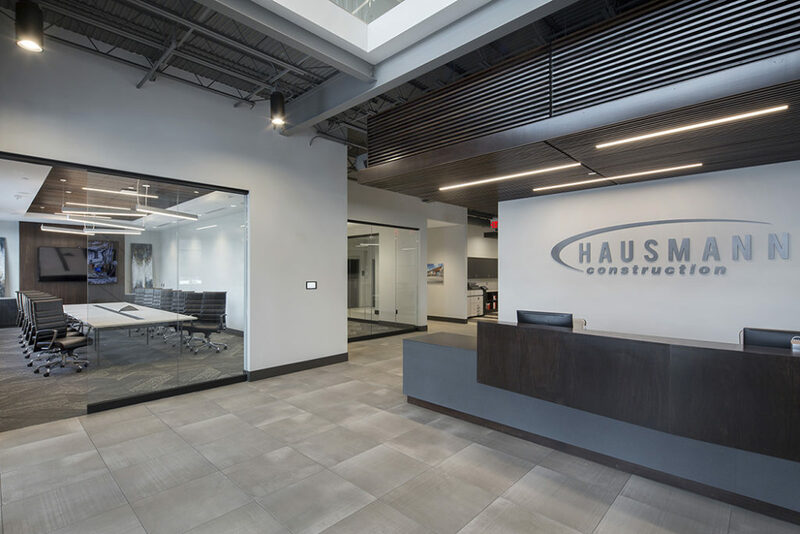 The design communicates the professionalism and expertise that Hausmann Construction is known for in the industry while creating a work environment and culture focused on employees and the clients they serve. I do not think there are specific corporate design trends in the last two years that have completely gone away. Instead, I believe design trends are evolving. An example of this was when benching systems were popular within office furniture design. This has not completely gone away; however, it has evolved to flexible work spaces that combine benching and many other types of work spaces in one office. An increased public awareness of health and happiness leading to better environments will fuel design trends to continue to evolve. It is our responsibility as designers to lead corporations in the direction of positive change in the work environment to ensure the safety and wellness of the users who occupy our spaces.